Caramel Puppy Chow was originally posted in 2014. Enjoy! Salted Caramel Puppy Chow is so addicting! If you’re a fan of puppy chow snack mix, you’re going to love this flavor combo. Chex cereal topped with caramel, chocolate, and powdered sugar. YUM! 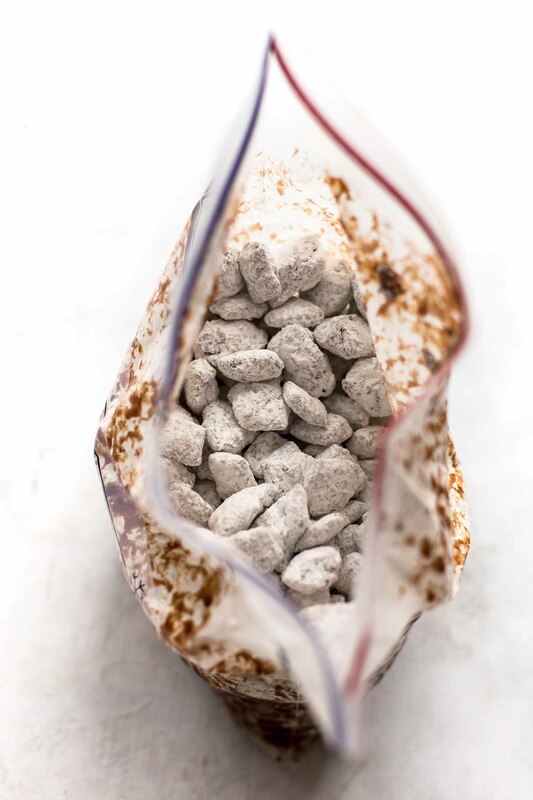 This salted caramel puppy chow chex recipe was sent straight from heaven to make our lives better. It’s the ultimate puppy chow snack mix! 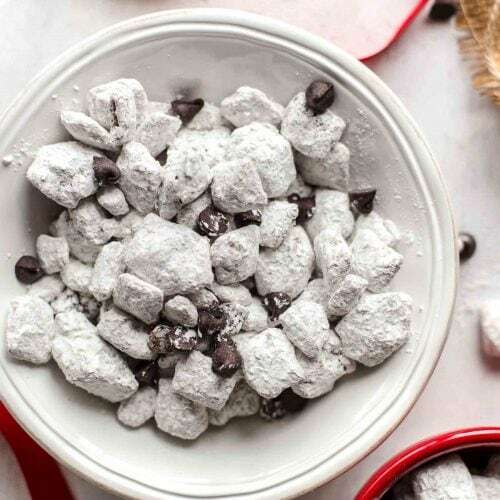 Growing up, my favorite thing (okay, one of my favorite things) my mom would make was Puppy Chow. I could have survived on this stuff FOR DAYS. I loved my mom’s recipe, but when other moms would make, I just didn’t like it as much. Maybe I was just a bit biased, but no one makes it like her! 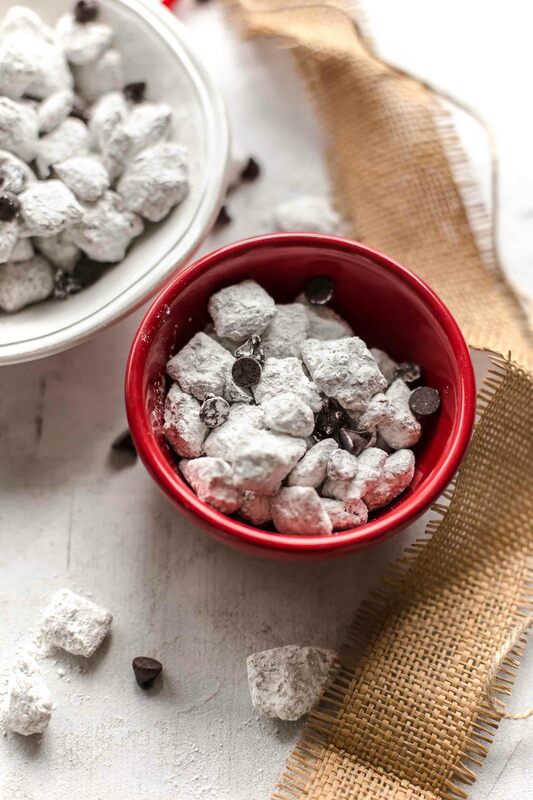 I think there are two secrets to a really good puppy chow snack mix: MILK CHOCOLATE and LOTS OF POWDERED SUGAR. 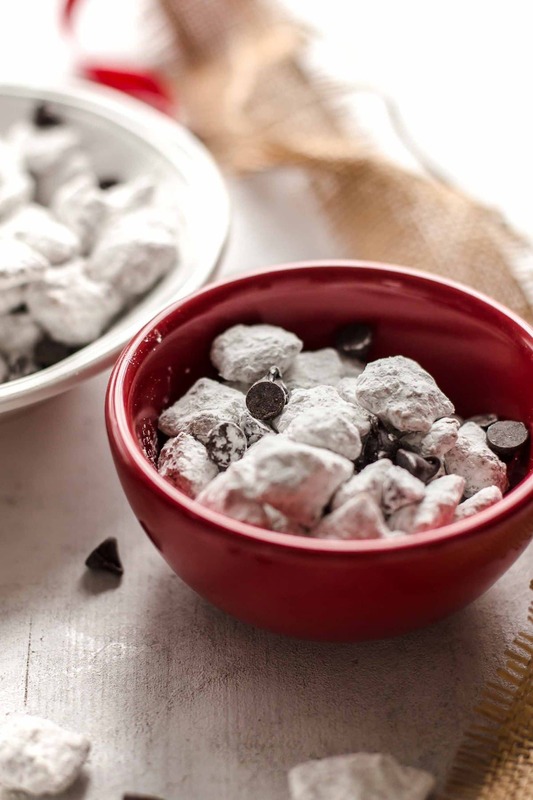 Yes, milk chocolate wins over dark chocolate every time (or at least when it comes to muddy buddies). And you really have to pile that powdered sugar on there to get the full effect. This is not a healthy treat, FYI, so you might as well make it as delicious as possible. 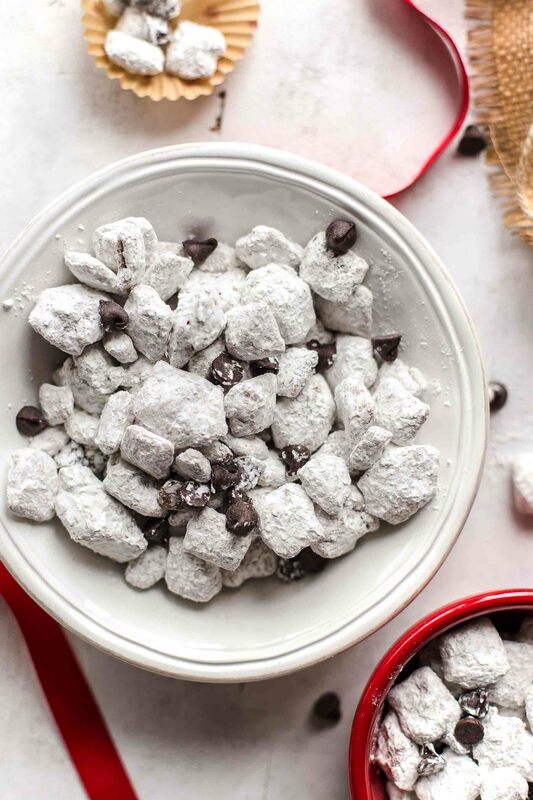 I’ve shared our original flavor recipe AND mint chocolate recipe (both are right here), and now I gotta share our Salted Caramel Puppy Chow recipe too. It’s just as good as the original, something to add into the mix. 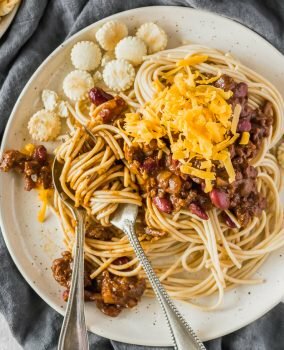 I love eating this stuff during the holiday season and making it as a fun party snack. This Salted Caramel Puppy Chow Chex Mix is a holiday favorite. Make a big batch to snack on or serve at your Christmas party! Funny story: Back when I was still working in an office, I took this to work in an attempt to be a 5-star employee. Eventually everyone loved it, but at first…well, based on the name, one of my co-workers actually thought it was for dogs. I guess he had never heard the term Puppy Chow! It’s a common mistake, but I assured him that it IS indeed meant for humans, not for puppies. Don’t get me wrong, Scout would love eating this. But no chocolate for dogs! I guess I should have written “muddy buddies” instead, another common name for this delicious treat. But I’ve always known it as puppy chow. The original Puppy Chow snack mix is wonderful, but it’s fun having different flavor variations for this stuff. This time, let’s take it up a notch by making Salted Caramel Puppy Chow! Basically, just replace the peanut butter in the original recipe with salted caramel. Oh, and add some Caramel Delightfulls (not sponsored…but I’m OBSESSED) for good measure. You could also add in some chopped Rolos for even more chocolate caramel goodness. This mix is meant for those who like to indulge, so let’s go all out! 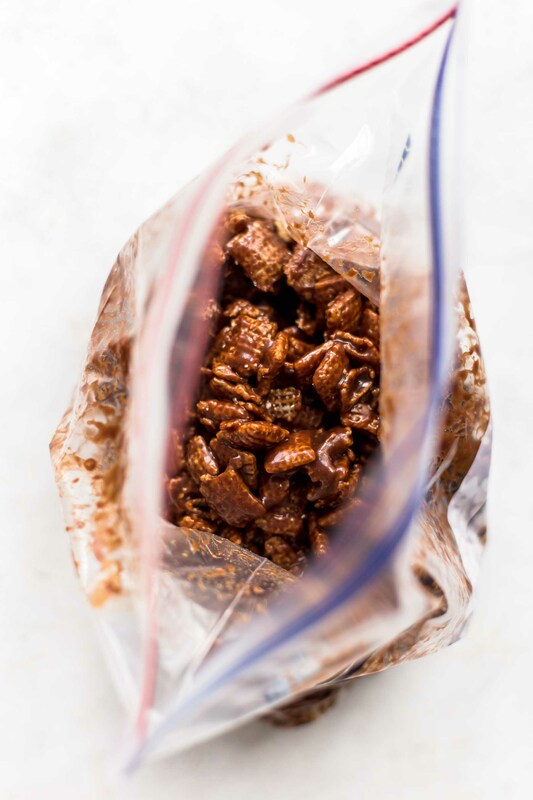 This puppy chow chex mix is SOOO easy to make. You just combine the ingredients to create the most delicious snack mix, then serve as you please. Set out a big bowl of it at parties, bag it up for Christmas gifts, or just snack away on the couch while watching TV. There’s never a bad time for this stuff! Melt chocolate chips in the microwave, stirring every 30 seconds. Next, melt the caramel topping/syrup in the microwave for about 45-60 seconds. Then combine the melted caramel and chocolate. Place Chex cereal in a large bowl, and pour the chocolate caramel mixture over it. Stir well, until the chex is fully coated. Pour the coated cereal into two separate resealable plastic bags. Pour half of the powdered sugar into each bag, then shake until the chex is fully coated. Once it’s done, pour the puppy chow mix into a bowl, and mix in any caramels, chocolate chips, etc. that you want to add in. 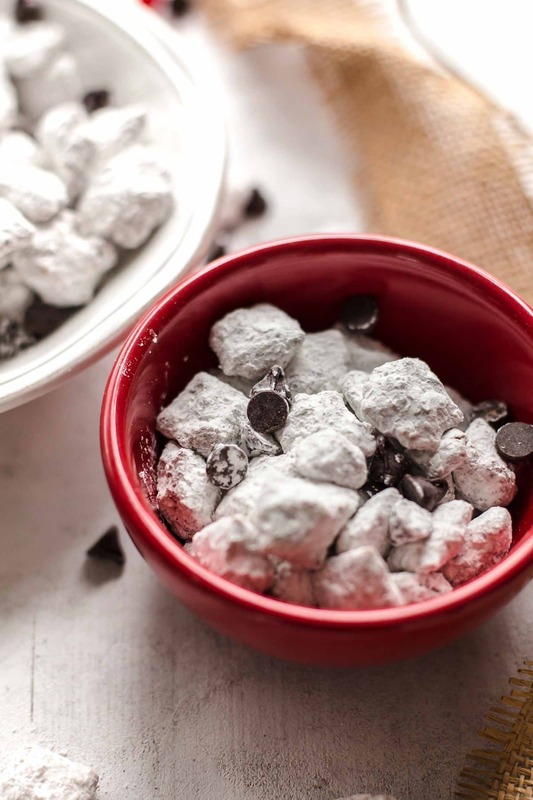 This is the perfect puppy chow snack for parties! Store any extra in an airtight container or resealable bag so you can snack away any time. Watch the video and Check the recipe card for How to Make Puppy Chow! Salted Caramel Puppy Chow is so addicting! If you're a fan of puppy chow snack mix, you're going to love this flavor combo. Chex cereal topped with caramel, chocolate, and powdered sugar. YUM! Melt chocolate in microwave, stirring every 30 seconds until melted. Set aside. Melt Caramel topping for 45 seconds-1 minute in the microwave. Combine with the chocolate. 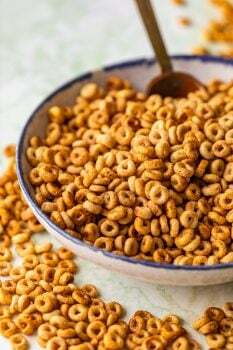 In a large bowl, pour caramel chocolate mixture over cereal and stir until all of the cereal is coated in the mixture. Place the cereal into two large Ziploc bags. Pour half of the powdered sugar into each bag and seal the bags. Toss the cereal in the powdered sugar until fully coated. Pour the coated cereal into a large bowl and stir in the Delightfuls chips as an added bonus. I am pretty sure that puppy chow should be is own food group. I mean something THAT good deserves it AmIright?? This looks so good girl! Pinned! Thanks so much Taylor!! Means a lot coming from you! No remove the lid (for the caramel sauce right?) when microwaving. The jar should also have heating instructions. Hope you love the recipe!! Wow – I love this idea and it looks waaay too good and waaay too bad to eat. haha. Great job – I love that tray! Puppy chow was a staple of my high school life too! Yum! Your bowls and other props are so gorgeous, it would be awesome if you started linking where the items are from! I’m mainly talking about the gold textured bowls and the white vessel held up by the wire basket…both so gorgeous! Thanks Laura! I might have to start doing that! The gold bowls are from west elm and the white container on the wire basket is from world market!! my store didn’t have salted caramel topping. could I add sea salt to regular caramel topping? how much do you think? 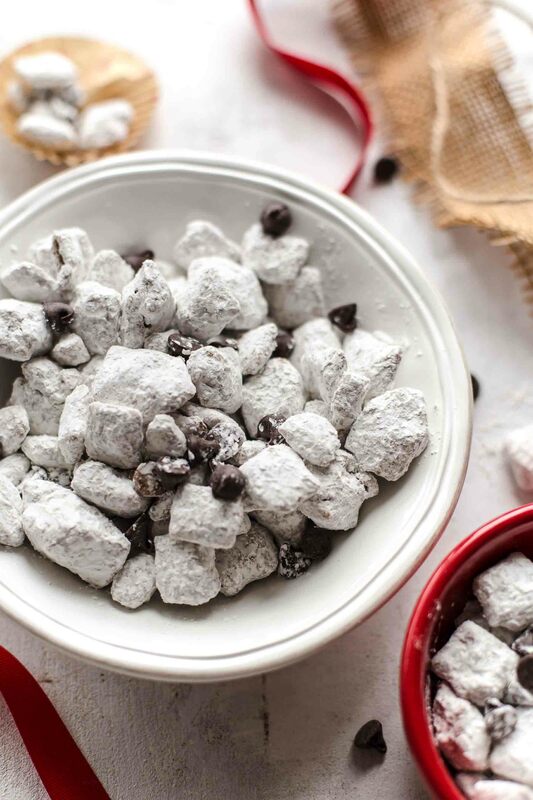 My daughter doesn’t care for chocolate so think she’d LOVE this version of puppy chow!!! Hey Carole! Yes you could just add sea salt. Start with just a little and taste as you go. Even if you just use regular caramel, it would still taste great! What size box of cereal did you use for this recipe? What size box of Chex, please? There was such an uproar about Puppy Chow name–I renamed ours People Chow. Then the grandkids could eat it!